Rougham Airfield, formerly Royal Air Force Station Bury St Edmunds or more simply RAF Bury St Edmunds is a former Royal Air Force station located 3 miles (4.8 km) east of Bury St Edmunds, Suffolk, England. It is not to be confused with the RAF grass strip on the western side of Bury St Edmunds known as RAF Westley, an area now part of the town itself. The airfield, now in private ownership and much reduced in size, is still active and is known as Rougham Airfield. 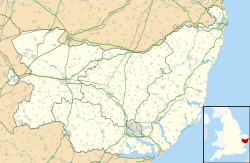 The airfield was originally and is now again known as Rougham as it is located north of that village between the A14 and the main railway line between Bury St Edmunds and Ipswich. It was built during 1941 and 1942 with three intersecting concrete runways. The main runway of 2,000 yards was aligned approximately E–W. It saw extensive use during the Second World War. With the end of military control, Bury St Edmunds airfield's concreted areas were broken up with most of the site being returned to agriculture. The old technical site has been developed into the Roughham Industrial Estate. The T2 hangars are still in use, for storage. The control tower, used for many years as a private dwelling, has now been restored and is used as a museum. The airfield, once again known as Rougham, now has two grass runways available for civil use. Gliding and model aircraft flying are frequent and several open-air events are organised each year. ^ "Welcome to Rougham Airfield". Rougham Airfield. Retrieved 9 May 2013. Wikimedia Commons has media related to RAF Bury St Edmunds.